Fussy eaters must be a tough gig for restaurants – front of house staff and chefs alike. In an era where food allergies are so prevalent, it’s simple for fussy diners to claim the slightest hint of coriander, for example, will send them diving for their Epipens or straight to the emergency room when the reality is they just don’t like the stuff. But Greedy Girl has learned that ingredients she’s often declared off-limits – with all the hyperbole she can muster – have this sneaky habit of being, well, pretty enjoyable in the hands of the right chef. There’s also no doubt that, over time, her palate has changed and developed. Travelling the world and eating in the best restaurants has definitely contributed to that. As such she’s made a vow: never say never. Take our trip to Bangkok last year. In her formative years, Greedy Girl rejected items made with coconut milk, always seeming to feel queasy after consuming a dish. At nights out in Thai restaurants, less fussy eaters around her demolished bowls of laksa and plates of green and red curries, while she stuck to ‘safe’ offerings, such as a Thai beef salad. During happy hour in the executive lounge of the exceptional Marriott Hotel Sukhumvit, a chef prepared the ‘dish of the day’. On our first night, it was a green curry and Greedy Girl demurred while gluttonous husband slurped it down with relish. It smelled so good, but first night of a 10 day stay? Greedy Girl decided not to risk it. A few nights later, a red curry was on offer. It looked and smelled delightful. What the heck. Greedy Girl dived into a bowl. And a second bowl. The velvety, luscious broth, the tender meat, the perfect noodles – it was an utter triumph. And the next day? Not even a hint of a queasy tum. Huzzah! Greedy Girl hasn’t looked back. One bad experience with food or an ingredient shouldn’t taint it forever more. Admittedly, that’s an easy thing to say if you’ve had a run in with something that’s resulted in food poisoning. While Greedy Girl would prefer not to have oysters (unless cooked) she’s, thankfully, never had a bad one. She’s told that experience can put a person off oysters for life. As we’ve gone around the world there have been ingredients that, on their face value, Greedy Girl was tempted to reject, especially in Japan. 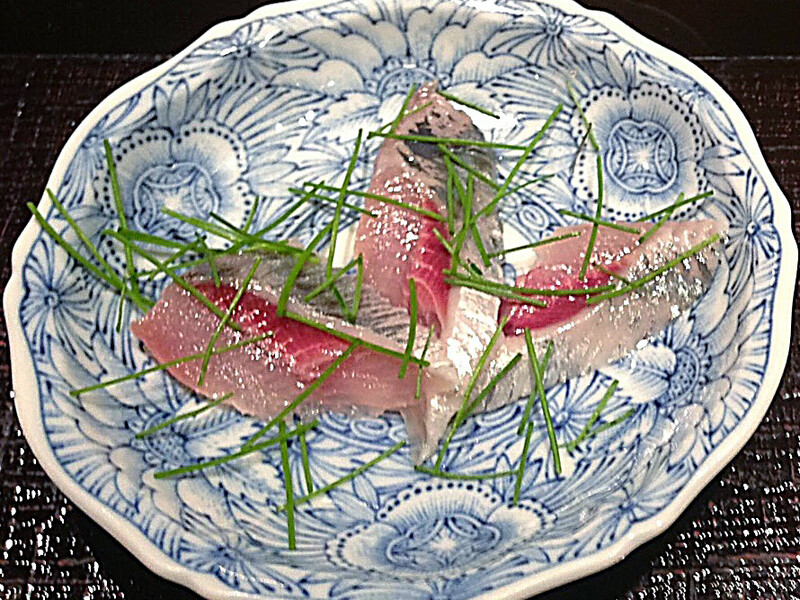 The extraordinary night she and gluttonous husband spent at Tokyo sushi bar Sushi Shin saw a dish of sashimi sardines put before her. Sardines, as we get them here in Australia in tins, are banned from casa Greedy Girl. Gluttonous husband loves them but the smell is something Greedy Girl just cannot deal with – and it lingers in our apartment for what seems forever. We were in awe of the chef’s knife skills as we watched him prepare every dish but the way he effortlessly filleted the sardine was particularly amazing. The dish smelled so fresh, without any of the pungency Greedy Girl has associated with the tinned variety, and presented delicately with some radish fronds and a dish of light Japanese soy and ginger on the side. It would have been poor form to reject it without even trying, so Greedy Girl waved a piece in the soy and ginger and popped it in her mouth. It was a revelation and very enjoyable. Over the years, other fish dishes or ingredients she’s tried have all come about at restaurants where there’s no menu or, given the profile of the chef, Greedy Girl’s opted to just give something a go. That has seen Greedy Girl sample such delicacies she’d never actually order from an a la carte menu, as eel (at the extraordinary Osteria Francescana and other restaurants), Monkfish liver (at Ryugin in Tokyo) and even crocodile (in Australia’s red heart at Uluru) although the preparation of the latter left a bit to be desired. Our first experience at Tetsuya in Sydney, helmed by Tetsuya Wakuda and one of Australia’s greatest Japanese fine-dining establishments, saw a plate of confit ocean trout put in front of us. Greedy Girl shook her head and remembers clearly saying to gluttonous husband that she wasn’t going to enjoy it. Again, a revelation. When the affable chef himself appeared at the end of service, she related her misgivings and commented it was so good, she could eat it again. He immediately replied: “I’ll bring you another”. During a visit to rural Japan, basically directly across from Tokyo on the other side of the main island, Greedy Girl and gluttonous husband became friends with the amazing Ben Flatt and Chikako Funashita, the husband-and-wife team heading up Flatt’s, a traditional guest house and restaurant showcasing traditional Japanese ingredients and local seafood re-invented in homemade Italian dishes. There, she was exposed to something only found in this part of Japan, Ishiri sauce. This is used in savoury dishes to add to the umami content; basically it ramps up the flavour. In this part of Japan it’s made from fermented squid intestines, while other areas might use sardines. Everyone we’ve told about it back in Australia has had a squeamish reaction but nearly every savoury dish gluttonous husband prepares in our home kitchen, from his shepherd’s pie, to the marinade for chicken wings, has a few drops of Ishiri sauce (we brought it back from Japan with us and our friend Ben keeps us supplied). One might blanch at the idea of a sauce made from fermented squid guts but one can’t argue with the results. Even foie gras, for many, many years, was off Greedy Girl’s menu. She’s aware many people have an ethical aversion to it, and that’s their prerogative, but Greedy Girl’s only experience of the liver family growing up was Lamb’s fry, which she didn’t enjoy. Again, it was a case of saying no to something without even trying it. Our first meal at the over-the-top Le Train Bleu in Paris’ Gare de Lyon changed all that. A seared slice was presented on rocket and accompanied by some sweet pear, as the only choice available for a starter on an express lunch menu. Gluttonous husband thought he was going to score both plates. Hah! Greedy Girl’s never looked back and foie gras is one of her favourite treats. Being a foodie doesn’t mean you need to love everything you eat. Greedy Girl has yet to achieve a breakthrough with beetroot as yet, even when it’s offered by some of the world’s top chefs, but she’s still prepared to give it a go. A huge amount of the pleasure and the fun when dining out is the journey of discovery. You might learn something about food – and even more about yourself.